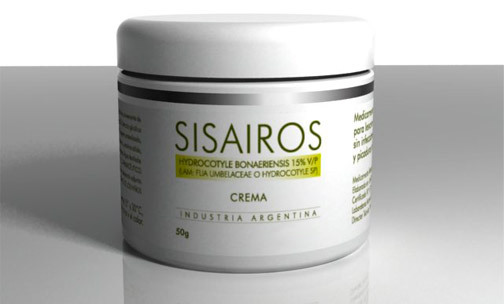 Decreases in a 75% treatments with topical corticoids. Achieves high and continuous moisture levels. Speeds physiologic process for dermis re-epithelization. Stays active on the treated area for 8 hours. Proved to be an effective contributing medication for treating dermatologic-immunologic disorders. Achieves patients comply with treatment due to product efficacy and safety. *No adverse effects of this kind have been reported up to this date. This is a herbaceous plant, also known as large leaf pennywort, dune water pennywort, coast pennywort, dollarweed, or ‘sombrerillo’, highly spread all over South America. In Argentina, this plant is frequently found in wet meadows, grasslands and dunes in Eastern and Southern area of the province of Buenos Aires. It grows all year long and flourishes during summertime. Plant has been used by the medical field in South America for many years, mainly against skin erythemas, psoriasis, dermal ulcers and burns. Leaves softened in alcohol are used on an external basis as poultice in order to heal swollen wounds and other skin swelling. Besides the infusion made with its leaves, flowering tops and stalks are used, and they are awarded with diuretic, stimulating, emmenagogs, and antiseptic properties. A cutaneous rash or simple dermatitis is a swelling or reddening skin condition implying a change on skin color or texture. It may be the external part of a bruise, blister, mole, freckle, wart, or lump on skin, etc. Contact dermatitis is a skin reaction as a result from an allergen agent exposure (contact allergic dermatitis) or an irritating agent exposure (contact irritating dermatitis). Phototoxic dermatitis occurs when allergen or irritating agent is activated by sunlight. Seborrhea or seborrheic dermatitis is a skin disease affecting scalp, face and chest. This is about a functional disorder of sebaceous glands causing a fat hyper-secretion. It causes reddish, irritated, flaky, and dandruff-like skin. It particularly affects skin areas that are full of sebaceous glands. Atopic dermatitis, frequently called (atopic) eczema, is a skin disease affecting scalp, face and chest. This disorder consists of a functional disorder of sebaceous glands causing a fat hyper-secretion, rash and flaky appearance; it is more usual in children and a multiple-factor condition, where environmental and innate factors are involved. People having eczema often present an allergic condition history. Erythema is a medical dermatology term referring a skin reddening conditioned by a swelling due to an excess of blood flow by means of vasodilation. Erythema is a sign of different infectious and skin diseases. With the above mentioned, it is within primary efflorescences.